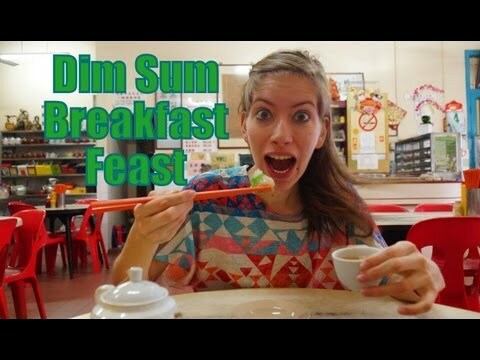 In our latest travel video we wake up early to visit a local restaurant (Chop Hock Seng) in Chinatown specializing in dim sum and Chinese tea in Malacca (Melaka), Malaysia. Waking up this early can only mean one thing: we’re off to get some dim sum! In search of a Cantonese breakfast, we only had to walk two blocks away from our guesthouse on Lebuh Chulia to find it. Dim Sum is literally my favorite breakfast in all of Asia and rivals any other breakfast I’ve had from other parts in the world. For breakfast we feast on shrimp, barbecue pork and sesame seed flavored bites. We wash it all down with hots cups of tea that is filled to the brim in a pot. We love the social atmosphere of the restaurant as we can hear locals engaging in candid conversations from afar. The simple decor is one of my favorite aspects of the restaurant: humble red plastic chairs and small circle tables provide the platform for feasting. Coming here day after day, you notice a very regular and loyal customer base of mostly elderly men reading newspapers or chatting with friends over tea. Traditional push-carts are a really nice added touch. I feel like a bit of a kid in a candy shop having everything laid out before my very eyes. This is strikingly different from contemporary Hong Kong style dim sum where menus with check boxes are the typical way to order these days. Something I find fascinating is that dim sum was originally not a main meal but merely a snack to be had with tea. These days you can see people eating dim sum for breakfast, lunch and dinner. Since I’ve been to Malaysia several times, I now associate eating dim sum with a main activity I do both in Malacca and George Town, Penang. Overall, the experience of eating here is fantastic and we plan to return each morning for breakfast until we move on to the next city. Are you a fan of dim sum? Is this something you’d be willing to try for breakfast and/or a late afternoon snack?